If it’s Labor Day weekend around Lincoln, Nebraska you can count on 2 things. Most importantly, it’s time for the sixth annual Racesaver Sprint Nationals. Sadly, the other thing is that it’s going to be wet! A half-hour downpour followed by drizzle and mist would have caused lots of dirt tracks to cancel, but Eagle Raceway isn’t most tracks and the Racesaver Sprint Nationals is just any race!! The track prep crew worked overtime to bring the track into shape to host 101 sprint car teams in what has come to be known as America’s Largest Sprint Car National Event. Then as the preliminary features were being run, large drops again began to fall. Eagle’s track prep crew took advantage of the half-hour delay to rework the track again. That worked wonders with 3-wide racing and slide jobs galore highlighting the rest of the evening’s action. During the preliminary racing there were several serious incidents. Josh Riggins got up and over the wall in turns 3 and 4, ending up with the 14J hanging on the catch fence in the second heat for the Racesaver sprints. Trey Gropp’s #54 ended up flipping after hitting the wall in turns 1 and 2 in the third heat. Heat 5 saw the #30 of Brandon Hickman ride the top rail in turns 1 and 2 in heat 5 and ended up rolling over. Mike Boston’s 51 and the 11 of Justin Melton made contact in heat 6 with Boston spinning and hitting the wall in turns 3 and 4. The D Feature saw Tige Jensen’s 12 start smoking from the right side of the engine. Jensen was determined to hang on to a transfer position but ended up with the engine consumed in fire a few laps from the finish. The C Feature saw the 22K of Kaleb Johnson start bouncing and end up flipping over the wall in turns 3 and 4 in nearly the same spot as Riggins had earlier. Gene Ackland suffered a stuck throttle in his #14G in the B Feature and ended up hitting the turn 1 wall full bore before flipping. Tritt after another circuit. 1 more lap saw Maas again move back to the lead. Oaks passed Tritt for second after another lap and grab the lead from Maas with 3 to go. The final top 4 were Oaks, Maas, Tritt and Hein. Oaks’ victory came from the 10th spot on the starting grid. He related “Oh Man!! That was definitely the best race of the year! I saw RJ and Tritt going to battle and I was just waiting for something to happen. Finally, I got the low line and started to count down laps. I got around RJ and took the lead. After that I just saw the checkered flag”. The A Main’s initial start was called back, but when there was an official lap in the books Kevin Ramey had used the same move he tried on the first attempt to put the 7M into the lead with Casey Burkham’s 45B, the 5 of Stu Snyder and Ethan Barrow’s 14S hot on his push bumper. Barrow moved to second on lap 2. Tyler Drueke pulled a 360-degree spin in turns 1 and 2 for a caution period the next time around. On lap 4, Justin Fifield’s 17X went very high in turns 1 and 2, hit the wall and ended up and over. Zach Newlin used the restart to put the 11Z into fourth. Chad Wilson’s #20 stopped in turn 4 the next lap for another caution. Jason Martin passed Newlin on lap 8, putting the 5X into fourth. Jake Bubak’s 74B hit John Carney’s 11C coming out of turn 2, sending Carney’s mount flipping. 2 laps following the restart Martin advanced to third. The final change in the top 4 came when Claud Estes cracked the top 4 in his 74E with 5 to go. From the checkered flag Ramey held off strong challenges from Burkham with the top 3 nearly nose to tail. The top 4 were Ramey, Burkham, Martin and Estes. The top 9 of Ramey, Burkham, Martin, Estes, Barrow, Luke Cranstons 45C, Newlin, Clint Benson in the 100 and Snyder will comprise the first 3 rows of Sunday’s Big Dance. 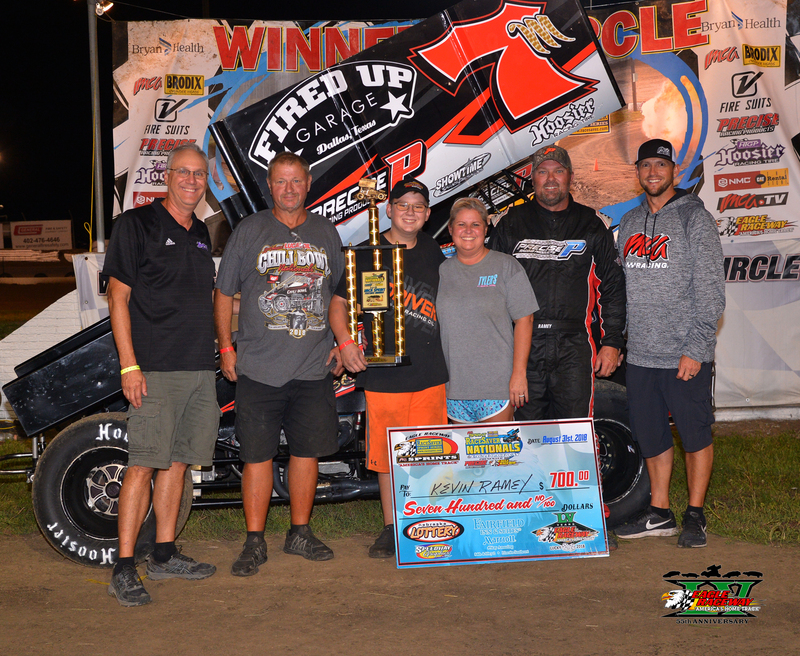 Ramey is currently leading the Racesaver IMCA points chase and won the Jake Ita Memorial Race of Champions at last year’s Racesaver Sprint Nationals. His victory came after starting third. “That first start was just a normal deal, with that many cars and with everybody dancing around. I had a good clean start on the first one and then had to turn around and do it again on the second one. I got around the 5 on the back straightaway and then passed the 45B. I just ran as hard as I could for the win. We had a great little hot rod tonight” he said. Ramey’s sponsors include Jambo’s Barbecue Pits, Precise Racing, Fired Up Garage and Weld. Saturday’s action has been moved up one hour. Racing will begin at 5 PM with no hot laps being run. Following the Racesaver A Feature the Jake Ita Memorial Race of Champions will be run. The front gates will open at 4:30. Adult admission is $15, youths 6-12 are $5 and children 5 and under are free. Pit gates open at 3 with pit passes costing $25. 1. Kevin Ramey Fort Worth, Tx. 2. Casey Burkham Combine, Tx. 3. Jason Martin Lincoln, Ne. 4. Claud Estes Godley, Tx. 5. Ethan Barrow Bloomington, In. 6. Luke Cranston Holcomb, Ks. 7. Zachary Newlin Millerstown, Pa. 8. Clint Benson Papillion, Ne. 9. Stuart Snyder Lincoln, Ne. 10. Tyler Drueke Eagle, Ne. 11. Steven Shebester 12. Dusty Ballenger Harrisburg, Sd. 13. Andy Shouse Oklahoma City, Ok. 14. Robert Vetter Wolfe City, Tx. 15. Chad Wilson North Richland Hills, Tx. 16. Colin Smith Sheldon, Ia. 17. John Ricketts Burleson, Tx. 18. John Carney Lubbock, Tx. 19. Jake Bubak Arvada, Co. 20. Justin Fifield Mesquite, Tx. 1. Zach Blurton Quinter, Ks. 2. Joey Danley Lincoln, Ne. 3. Robert Vetter Wolfe City, Tx. 4. Michael Day Greenville, Tx. 5. Brandon Horton Omaha, Ne. 6. Adam Gullion Lincoln, Ne. 7. Jason Howell Fort Worth, Tx. 8. Blake Dacus Fletcher, Ok. 9. Daniel Estes Jr. Burleson, Tx. 10. Scott Lutz Jonestown, Pa. 11. Matt Etzelmiller Keller, Tx. 12. Michelle Melton Flower Mound, Tx. 13. Brandon Allen St Peter, Mn. 14. Kaleb Johnson Sioux Falls, Sd. 15. Mark Pace Lincoln, Ne. 16. Mike Moore Des Moines, Ia. 17. Ken Duke Jr Selinsgrove, Pa. DNS. Dustin Welch Bryan, Tx. 1. Scott Lutz Jonestown, Pa. 2. Dustin Welch Bryan, Tx. 3. Ken Duke Jr Selinsgrove, Pa. 4. Mark Pace Lincoln, Ne. 5. Cody Ledger Omaha, Ne. 6. Ryan King Bennet, Ne. 7. Logan Scherb Bowie, Tx. 8. Nathan Weiler Lavista, Ne. 9. Doug Lovegrove Waverly, Ne. 10. Jerald Harris Harrisonburg, Va. 11. Keith Dragoo Greenwood, Ne. 12. Ryan Kitchen(r) Lincoln, Ne. 13. Ryan Hall Midlothian, Tx. 14. Tyler Thompson Des Moines, Ia. 15. Tige Jensen(r) Lincoln, Ne. 16. Danny Nekolite O’neill, Ne. 17. Frank Rodgers Lucas, Ia. DNS. David Luckie Lubbock, Tx. 1. Ryan Kitchen(r) Lincoln, Ne. 2. Nathan Weiler Lavista, Ne. 3. Tyler Thompson Des Moines, Ia. 4. Ryan Hall Midlothian, Tx. 5. Ryan Voss Spirit Lake, Ia. 6. Monty Ferriera Fresno, Ca. 7. Chase Weiler Lincoln, Ne. 8. Blake Scott Pauls Valley, Ok. 9. Shon Pointer Grand Island, Ne. 10. Boyd Peterson Ithaca, Ne. 11. Dan Satriano Papillion, Ne. 12. Jeremy Schultz Stewart, Mn. 13. Junior Jenkins Greenville, Tx. 14. Tim Hilfiker Greenwood, Ne. 15. Mark Klis Jr Waxahachie, Tx. 16. Jimmy Grasso Omaha, Ne. 17. Gary Floyd San Angelo, Tx. 18. Tom Belsky North Platte, Ne. 1. Shon Pointer Grand Island, Ne. 2. Monty Ferriera Fresno, Ca. 3. Ryan Hall Midlothian, Tx. 4. Dan Satriano Papillion, Ne. 5. Clayton Christensen Spencer, Ia. 6. Austin McLean Loveland, Co. 7. Jason Danley Lincoln, Ne. 8. Mike Houseman Jr Des Moines, Ia. 9. Neil Nickolite Bellwood, Ne. 10. Justin Melton Lewisville, Tx. 11. Nick Bryan Lincoln, Ne. 12. Randy Sterling Morrisdale, Pa. 13. Charlie McDonald Jefferson, Tx. 14. Daren Bolac Moyock, Nc. 15. Jeff Pendergast Norfolk, Ne. 16. Samantha Lieberman South Hampton, Pa. 17. John Webster North Platte, Ne. 18. Chris Kelly Moore, Ok.
1. Jason Danley Lincoln, Ne. 2. Austin McLean Loveland, Co. 3. Mike Houseman Jr Des Moines, Ia. 4. Neil Nickolite Bellwood, Ne. 5. Trey Gropp(r) Lincoln, Ne. 6. Ben Woods Newton, Ia. 7. Lucas Scherb Decatur, Tx. 8. Bob Hildreth Iowa Falls, Ia. 9. Charlie Ware Hallieford, Va. 10. Jason Miller Omaha, Ne. 11. Dwight Carter Lincoln, Ne. 12. Trevor Serbus Olivia, Mn. DNS. Josh Riggins(r) Lincoln, Ne. DNS. Bruce Allen Mankato, Mn. DNS. Brandon Hickman Lubbock, Tx. DNS. Mike Boston Lincoln, Ne. DNS. Bill Garrow Lincoln, Ne. 1. Zachary Newlin Millerstown, Pa. 2. Anton Hernandez 3. Zach Blurton Quinter, Ks. 4. Jerald Harris Harrisonburg, Va. 5. Jimmy Grasso Omaha, Ne. 6. Samantha Lieberman South Hampton, Pa. 7. Neil Nickolite Bellwood, Ne. DNS. Charlie Ware Hallieford, Va.
1. Jake Bubak Arvada, Co. 2. Steven Shebester 3. Mike Moore Des Moines, Ia. 4. Frank Rodgers Lucas, Ia. 5. Jeremy Schultz Stewart, Mn. 6. Charlie McDonald Jefferson, Tx. 7. Bruce Allen Mankato, Mn. 1. Colin Smith Sheldon, Ia. 2. John Ricketts Burleson, Tx. 3. Brandon Allen St Peter, Mn. 4. Ryan King Bennet, Ne. 5. Nathan Weiler Lavista, Ne. 6. Chris Kelly Moore, Ok. 7. Bill Garrow Lincoln, Ne. 1. Clint Benson Papillion, Ne. 2. Gene Ackland Martell, Ne. 3. Joey Danley Lincoln, Ne. 4. Scott Lutz Jonestown, Pa. 5. Blake Scott Pauls Valley, Ok. 6. Monty Ferriera Fresno, Ca. 7. Bob Hildreth Iowa Falls, Ia. 1. Dusty Ballenger Harrisburg, Sd. 2. Brett Becker Odessa, Tx. 3. Matt Etzelmiller Keller, Tx. 4. Danny Nekolite O’neill, Ne. 5. Junior Jenkins Greenville, Tx. 6. John Webster North Platte, Ne. 7. Austin McLean Loveland, Co.
1. Ethan Barrow Bloomington, In. 2. Andy Shouse Oklahoma City, Ok. 3. Adam Gullion Lincoln, Ne. 4. Doug Lovegrove Waverly, Ne. 5. Ryan Kitchen(r) Lincoln, Ne. 6. Randy Sterling Morrisdale, Pa. 7. Lucas Scherb Decatur, Tx. 1. Jason Martin Lincoln, Ne. 2. Tyler Drueke Eagle, Ne. 3. Blake Dacus Fletcher, Ok. 4. Ken Duke Jr Selinsgrove, Pa. 5. Ryan Voss Spirit Lake, Ia. 6. Daren Bolac Moyock, Nc. 7. Josh Riggins(r) Lincoln, Ne. 8. Trevor Serbus Olivia, Mn. 1. John Carney Lubbock, Tx. 2. Matt Richards Lincoln, Ne. 3. Daniel Estes Jr. Burleson, Tx. 4. Dustin Welch Bryan, Tx. 5. Tom Belsky North Platte, Ne. 6. Jeff Pendergast Norfolk, Ne. 7. Trey Gropp(r) Lincoln, Ne. 8. Jason Miller Omaha, Ne. 1. Justin Fifield Mesquite, Tx. 2. Toby Chapman Panama, Ne. 3. Kaleb Johnson Sioux Falls, Sd. 4. Cody Ledger Omaha, Ne. 5. Tim Hilfiker Greenwood, Ne. 6. Ryan Hall Midlothian, Tx. 7. Jason Danley Lincoln, Ne. 1. Kevin Ramey Fort Worth, Tx. 2. Jesse (chip) Graham Lewisville, Tx. 3. Michelle Melton Flower Mound, Tx. 4. David Luckie Lubbock, Tx. 5. Boyd Peterson Ithaca, Ne. 6. Dan Satriano Papillion, Ne. 7. Brandon Hickman Lubbock, Tx. 1. Casey Burkham Combine, Tx. 2. Colby Estes Mansfield, Tx. 3. Robert Vetter Wolfe City, Tx. 4. Keith Dragoo Greenwood, Ne. 5. Mark Klis Jr Waxahachie, Tx. 6. Justin Melton Lewisville, Tx. 7. Mike Boston Lincoln, Ne. 1. Claud Estes Godley, Tx. 2. Chad Wilson North Richland Hills, Tx. 3. Jason Howell Fort Worth, Tx. 4. Mark Pace Lincoln, Ne. 5. Gary Floyd San Angelo, Tx. 6. Clayton Christensen Spencer, Ia. 7. Dwight Carter Lincoln, Ne. 1. Luke Cranston Holcomb, Ks. 2. Rod Henning Middleton, Oh. 3. Brandon Horton Omaha, Ne. 4. Logan Scherb Bowie, Tx. 5. Tyler Thompson Des Moines, Ia. 6. Shon Pointer Grand Island, Ne. 7. Mike Houseman Jr Des Moines, Ia. 1. Stuart Snyder Lincoln, Ne. 2. Brandon Bosma Round Lake, Mn. 3. Michael Day Greenville, Tx. 4. Tige Jensen(r) Lincoln, Ne. 5. Chase Weiler Lincoln, Ne. 6. Nick Bryan Lincoln, Ne. 7. Ben Woods Newton, Ia.